First, there was the Twin Cam Angels. Then there was the G3 princesses. Now, get ready for the Hero Mama league! 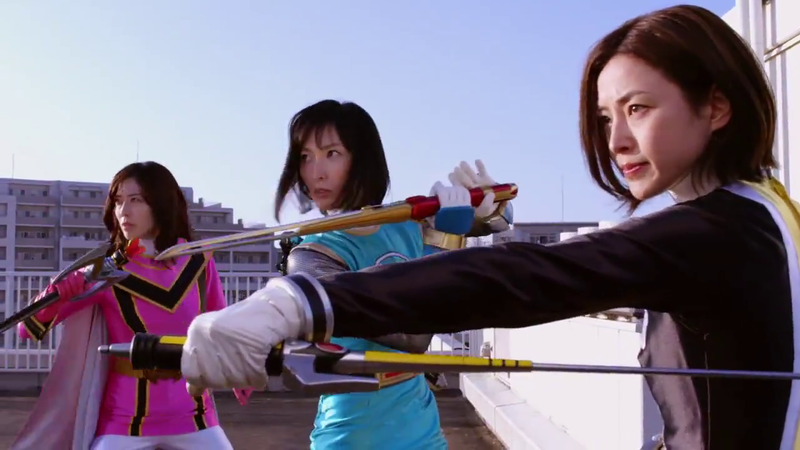 See them in action in this teaser trailer! Hero Mama League stars Nao Nagasawa as Hurricane Blue, Ayumi Kinoshita as Deka Yellow and Ayumi Beppu as Magi Pink and also features Hideya Tawada (Zyuoh Eagle) and will premiere on May 13, 2018. Wait what..?? Okay. We all know Jasmine is already married & even have a baby in Dekaranger 10 years after. But Houka & Nanami? Yes, we never get Magiranger 10 Years after so Houka having a child is a possibility. But we don't see Nanami having a husband or even a boyfriend in Hurricaneger 10 Years after. And now she's having a child.. I don't know what to say. The video's been labelled as private. That's great. Really glad to see Houka back. Never liked her very much during Magiranger's run, but I'm curious to see how they'll advance her character. Um...can you put in another video? The video is private. Interesting. Though, can you find another version of the video? I can't watch it. Wasn't Ayumi Beppu living in France or something?? Another April fools video and blog entry from JEFusion , I found it watchable ,its all black. The only part worth watching was in the trailer. Namely Nao back in skintight spandex.